elobeatlesforever: Jeff Lynne's ELO: One Week to Wembley! Yours Truly KJS and elobeatlesforever (elobf) have been quietly counting down the days to the appearance of Jeff Lynne's ELO and friends at London's iconic Wembley Stadium on Saturday 24th June and their trio of dates in Sheffield, Glasgow and Hull via elobf @ Twitter for almost a year now so it was reassuring to (finally) collect the tickets for the Wembley show this morning, just seven days before what is likely to be one of the gigs of the year. 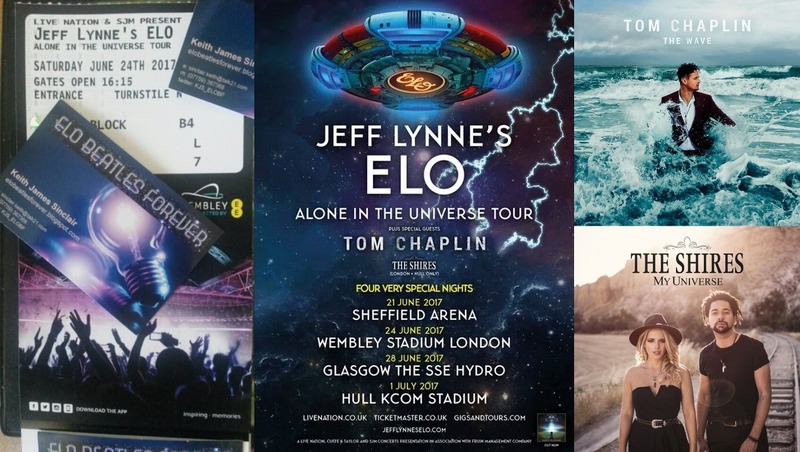 Jeff Lynne's ELO will, of course, be joined by Tom Chaplin (of Keane fame) for all four dates with The Shires also on the bill at Wembley and Hull for the 2017 leg of the "Alone In The Universe" UK tour. Whilst special unannounced guests might be revealed during the tour, we should not expect to see Jeff's Wilbury brothers Tom Petty and Bob Dylan as they are both currently on tour in the United States and/or Canada. Yours Truly KJS (and by extension elobf) will be there too, nestled amongst the rows in Block B4. It would be nice to meet some of the lovely people who perchance occasionally to visit (or even) read elobeatlesforever (elobf). Please say "Hi!" if you bump into me! See you there? elobeatlesforever (elobf) recommends Jeff Lynne's ELO, Tom Chaplin and The Shires live at Sheffield, London, Glasgow and Hull to those enlightened folks who enjoy the music of ELO, Jeff Lynne, Roy Wood, The Move, The Idle Race, 'Brum Beat', The Traveling Wilburys, The Beatles and related artistes.